In my oppinion you should add more variety to the tilesets. Like Flowers, sticks, stones and more variety in general. If possible doodad plants like bushes would be nice aswell. 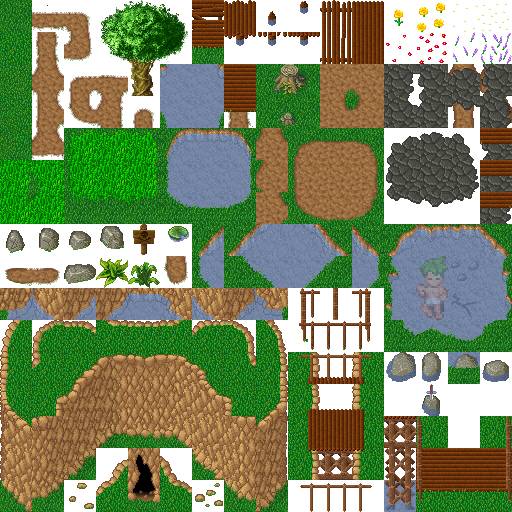 TaShadan wrote: In my oppinion you should add more variety to the tilesets. Like Flowers, sticks, stones and more variety in general. If possible doodad plants like bushes would be nice aswell. I agree, it would be nice to have more variety. It seems to me that most of what's in this tileset (which thankfully is licensed under the GPLv2) doesn't fit the style very well, but the flowers could work well with the tiles we have, I'd have to test them. But since windgus has successfully implemented tree units, I wonder if wyrmsun or wyrmgus should use units instead of tiles for certain things like mushrooms, so they can function similar to in my game (where they are animated to grow, die, and reproduce in a life cycle, and if walked on, they explode in a puff of smoke stunning whoever walked on them, or can be picked up by elves and thrown as stun bombs). Also with things like the banner in the image or other tall objects like plants, using units would be better for depth issues. Love it! Is it possible to add more variation to the transition tiles? Are there plans for a second height level similar to starcraft? Last edited by TaShadan on Fri Feb 14, 2014 6:38 pm, edited 1 time in total. Any game on Stratagus Engine can implement that, you need only to draw sprites for your units and define them, them place them in-game to neutral player(it's the same way I've explained you in PM about unit tiles). I've been using that method in Doom Wars for a long time, it's pretty obvious . Since I've expanded the animation code, it' possible to create decorations of any kind. You can use particles to make effects like explosions look better. The one big disadvantage of that method that it is very expensive(CPU, memory comsuption), so placing more than 2000 units on map may degrade perfomance. These look very nice. As cybermind said, it is possible to implement them as units. You can see in Wyrmsun the commented out definition of "unit-purple-flowers" in /scripts/units.lua to see how I defined a decoration unit when doing tests in that regard. It is also possible to randomly generate these decoration units in maps that don't have them, so that the already-existing maps can make use of them. TaShadan wrote: Love it! Is it possible to add more variation to the transition tiles? I'm not sure if I understood what you meant with your first question, but in regards to your second, there are currently no plans to include a second height level, but it should be possible to do so, in the following manner. Let's say a new terrain type, "mountainous", is added. The solid tiles of this new terrain type would be walkable, but its transition tiles with normal land tiles (which could look like cliffs) wouldn't be walkable, and thus if a unit is on the hill it walk within it, but it can't walk through the cliffs. This way, different height levels could be simulated. I'm not sure if it would be possible to add a ramp, to allow walking between different height levels, though. I mean the transition between the different tile types (for example green and dirt) are too straight and always the same. Would be nice to have more different transition tiles to add more variety. I had no doubt it was possible, I was just wondering if it 'should' be used in wyrmsun, and to what extent, in which case I shouldn't make tiles for some things, at least not with terrain beneath them, and in which case I would make some things larger than 32*32 and with animations. I was already thinking I would stick some of my other stuff into stratagus (a slightly different perspective than here), and and have much larger tree units rather than tree tiles. b_o wrote: I had no doubt it was possible, I was just wondering if it 'should' be used in wyrmsun, and to what extent, in which case I shouldn't make tiles for some things, at least not with terrain beneath them, and in which case I would make some things larger than 32*32 and with animations. I was already thinking I would stick some of my other stuff into stratagus (a slightly different perspective than here), and and have much larger tree units rather than tree tiles. Ah, sorry, I thought you had meant whether it would be feasible code-wise. In any case, I think that it would be a very good idea to use decoration units in Wyrmsun, particularly since we can do interesting stuff like the life cycles which you mentioned.